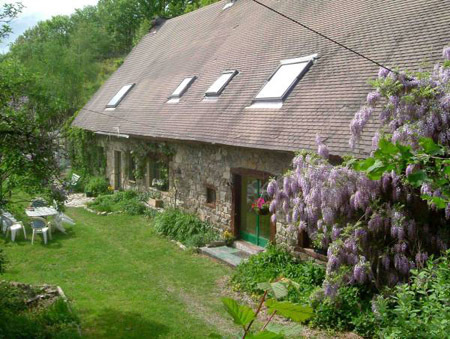 We are a young English family who run a Bed & Breakfast deep in the heart of the Auvergne. Here we aim to provide you with everything that you could need for a peaceful stress free holiday. Welcome to the undiscovered Cantal department in the Auvergne region of central France. Set in the Parc Natural Regional des Volcans, La Fromental is a restored Cantal farmhouse built in about 1850, set in seven acres of sylvan scenery with views of the Puy de Sancy, the highest peak of the Massif Central. The rich lush dairy pastures and unspoilt villages, the volcanic landscapes of Monts Dômes with their rolling hills cloaked in forests and pitted with long dormant volcanic craters, is usually missed by those heading for the more dramatic mountain areas of the Alps or Pyrenees. Yet for those who enjoy exploring along quiet roads, or sitting in the sun in a quiet village square, the region has much to offer. The Massif Central was formed by a series of volcanic eruptions that created lakes and mountains and high plateaux that have subsequently been eroded over many centuries. Rivers have cut their way through the soft rock creating deep narrow gorges, a dramatic landscape that is now cloaked in mixed forest with green valleys and sparkling rivers, its highest peak often with its summit lost in the clouds. Cutting through the plateaux are numerous underground streams and rivers that have carved out extensive and fantastic cave systems. The countryside is dotted with little medieval towns and villages. There is a wealth of medieval chateaux, some perched on volcanic outcrops, which were baronial homes rather than fortresses. There is an abundance of Romanesque churches, the local style making good use of the soft volcanic rock. In addition we also offer our knowledge of the local area with numerous walks and hikes to explore, and with the aid of nature cards identify the small and not so small fauna and flora you may encounter. We can also provide maps and advice for drives through the area which take in the local scenery and attractions. For those who just want to relax in the peace and tranquillity of La Fromental we have 7 acres to stroll around, or, relax and unwind in our garden. Children (of all ages!) will love to explore the land, and if they keep very quiet the deer and wild birds will appear. In the autumn the woods are full of funghi and we give advice on the varieties found and where to search for them.